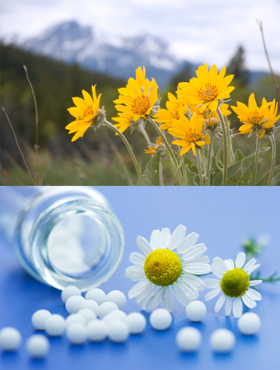 Homeopaths use a wide range of substances as remedies to help cure the sick. These substances can be animal, plant or mineral based. We will use a very tiny dose of the substance which is prepared using a special process of repeated dilution and shaking. This makes it very safe to use and means the remedies can be taken by pregnant women, young children and people on medication. The ideas on which homoeopathy are based have been around and used for hundreds and even thousands of years. However, the term ‘homeopathy’ was first used approximately 200 years ago by a German physician called Samuel Hahnemann. Hahnemann is considered the founder of modern day homeopathy. Homeopathy is based on the principle of ‘like cures like’. Put simply a substance that can cause symptoms of illness in a well person, can cure those same symptoms in a sick person. Homeopaths use a minute dose of the substance to encourage the patient’s immune system to respond and heal. For example, if you chop up an onion, it can cause your eyes to stream and your nose to run, well the red onion is used as a homeopathic remedy to help people with streaming colds, or with hay fever symptoms. Hahnemann said that ‘there are no diseases only diseased individuals’. And today homoeopaths still use this approach. When prescribing for a patient the homoeopath will look at the whole picture of the person in front of them, not just a specific physical symptom or diagnosis. Cure takes place when the remedy chosen closely matches the patient’s mental, emotional and physical symptoms. Homeopathy is a safe and gentle treatment which has helped people suffering from a range of conditions, often after conventional treatment has failed. It can also be used alongside conventional medicine without interacting with pharmaceutical drugs.